Manage your portfolio with flawless precision...in minutes. 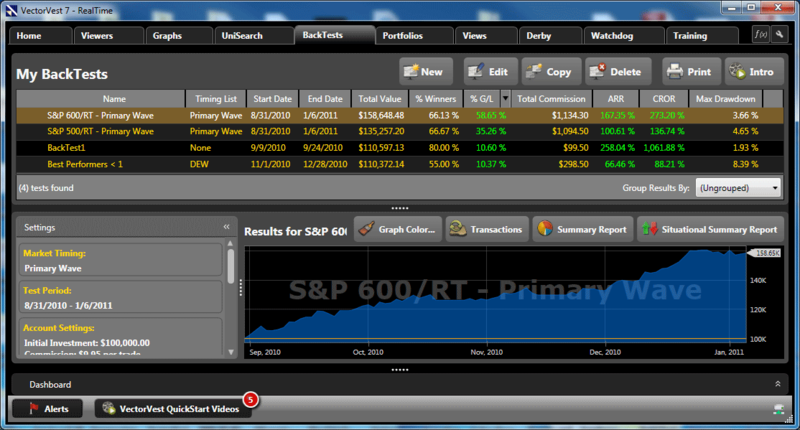 Portfolio Genius automatically manages a paper portfolio using the trading rules and preferences you select. Then with the help of the AutoTimer, Portfolio Genius becomes even smarter, seamlessly integrating the VectorVest market timing system of your choice into your trading plan. You'll never miss a critical change in market direction again! With just a couple clicks of your mouse, the Portfolio Genius with AutoTimer will let you know exactly which trades to make and when to make them. Trading your investment plan with precision and discipline has NEVER been easier. Try AutoTimer FREE today! Not sure what to trade? Want to test some ideas without risking your hard earned money? AutoTimer can help with testing your trading plan too. It makes backtesting quick, easy and fun! The all new VectorVest AutoTimer makes backtesting so quick and easy you'll test ideas faster than you can come up with new ones! 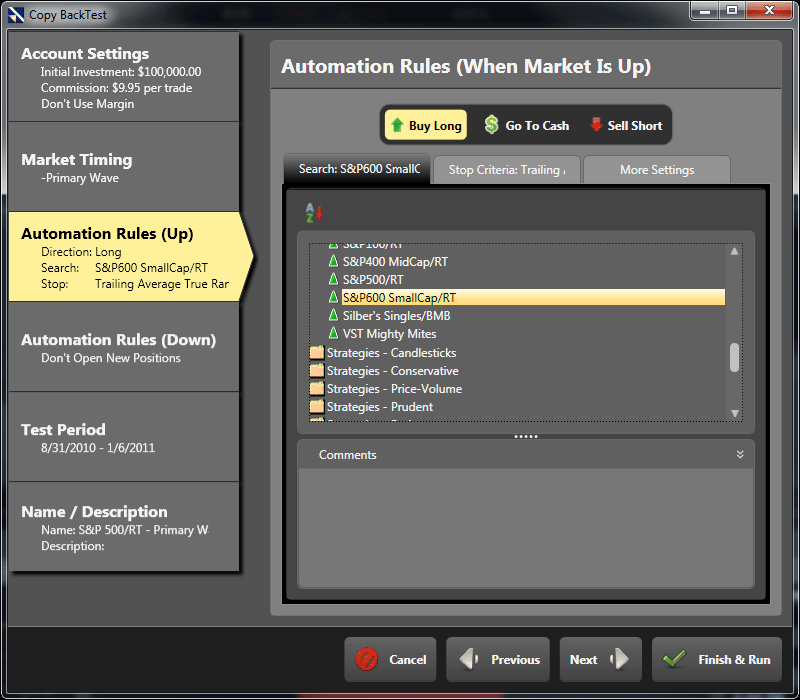 Now with Market Timing, Automation Rules and Stop Criteria integrated into an easy to use interface, you'll develop confidence in your trading system before risking a cent. The AutoTimer walks you through six simple steps to complete a backtest. Use the defaults or select your own settings to mirror your trading. 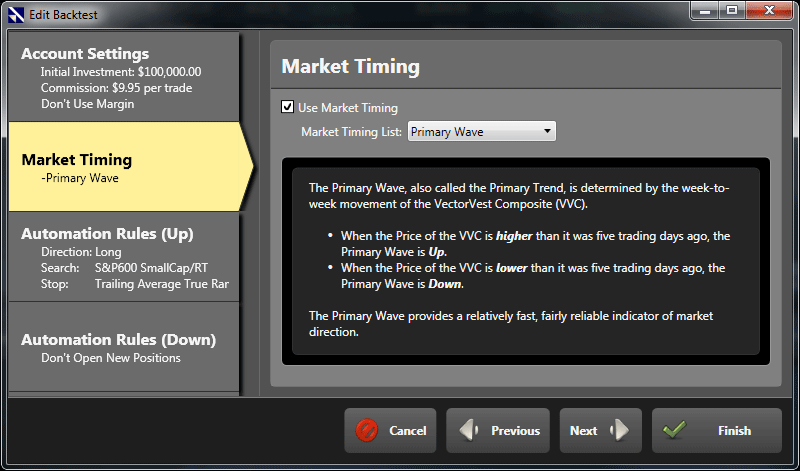 With VectorVest’s Market Timing built-in, a mouse click defines your timing system and start and end dates. If you’re conservative, select Confirmed Calls. Aggressive? Select Primary Wave. Somewhere in between, select the DEW Timing System. Click QuickDates to select a start date based on your timing signal. Everything is designed with ease of use in mind. Test all of VectorVest’s built in strategies, modify them or build your own. Select from our time-tested Stop Criteria including an all new Trailing Average True Range. Buy Long, Sell Short or go to cash. 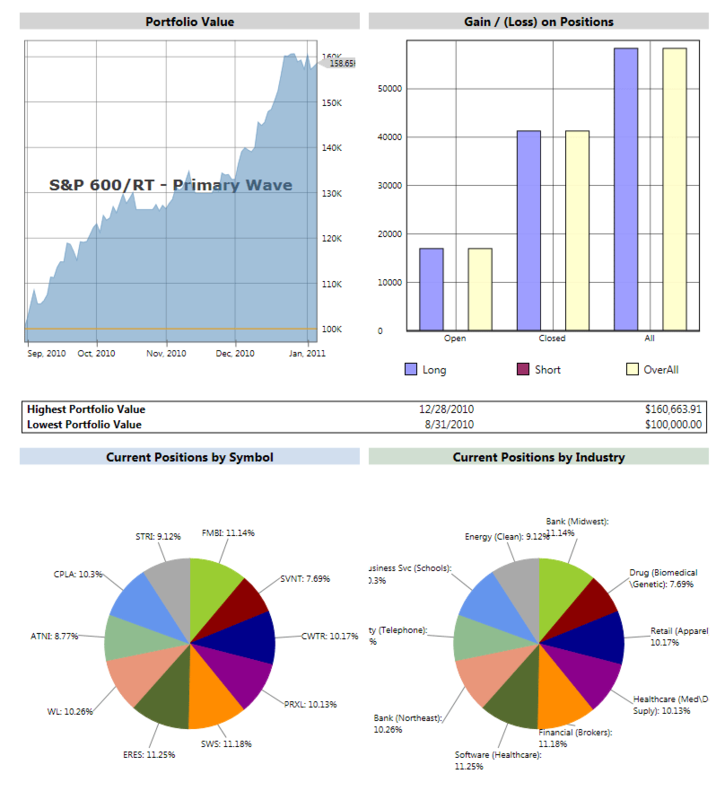 Automatically replace positions or allow your stops to extinguish the portfolio. Maintain diversification across industries and sectors while you control the number of positions. Click Finish & Run and the AutoTimer does the work for you. Copy the portfolio, modify a variable and another click tests that iteration. View the results and move on. Like the results? Check the Situational Summary Report to drill down to more detail. Check diversification in the Summary Report. Group results by the variable you are investigating. The AutoTimer does the bookkeeping for you. Before you risk a dollar, test your strategies to develop a solid foundation for your trading system.